I revel in the awareness that the world is a complex, compelling, stunning place. The closer I look, the richer are the rewards. 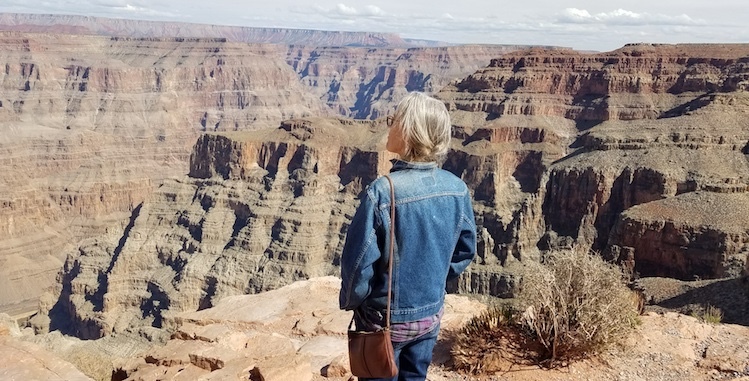 This complexity often presents as contradictory and confusing, which has led me to make partial sense of my navigation through experiences and thoughts by looking, searching, collecting, pondering and devising principles of order that vary from project to project. Over the decades of working in the studio, I've adopted many modes of working; have developed facility with a variety of methods and material. My early days of following the impulse to become a visual artist were rooted in two-dimensions. I floundered there until I acknowledged that I am more comfortable and facile with the manipulation of and creation of objects. Regardless of the materials used, or their level of interactivity, exploring connections by linking and layering ideas and objects is the basis for my studio work. Here's a glimpse . . . I began publishing under the Ravenpress imprint in 1996. Ravenpress publications are held in private, public and special collections worldwide. Although several titles are out of print, those that are still available can be purchased via the links in the footer of this page. Click here to view Ravenpress books. 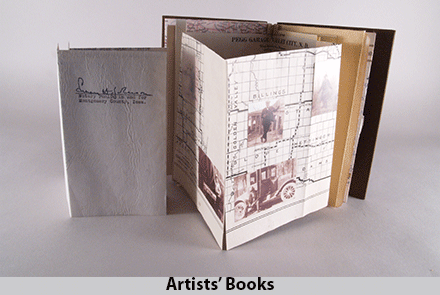 I use the phrase "artists' books" to describe unique book works (as opposed to those produced as multiples, or limited editions). 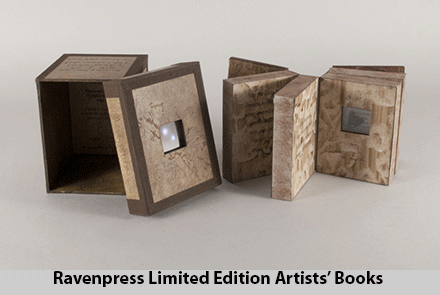 I think of the artists' book works I create as interactive sculptures realized in the form of the book. I work in a wide variety of materials, including those not often associated with the book form, thus necessitating structural re-design and innovations. To purchase or inquire about availability, please contact me directly. Click here to view artists' books. I have an abundance of materials gathered over the years, many of them from various family archives. It is a favorite indulgence to create works from these objects, many of which seem to glow with a well earned patina of age and history. When I get to work with these objects, I cast aside concerns of form and direction. The days when I go to the studio and 'see what happens' are among my favorite and most memorable days. I think of them as my boxing days. 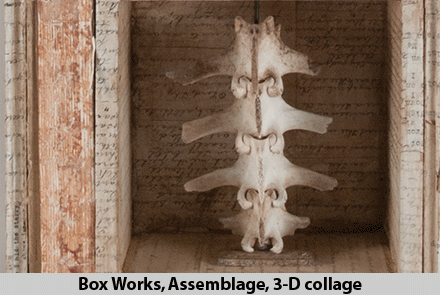 Click here to view box works and here to view assemblage and collage works. My work has been included in dozens of exhibitions throughout the United States, and occasionally in other countries (Austria, Canada). Download detailed CV. I teach workshops, both structure and content based, all over the country. Click here to learn about upcoming workshops. Click here for a PDF of current workshop topics.